Do you have what it takes to be a Designing Weaver? One of my favorite art groups I belong to is Designing Weavers. It is the one group that really inspires me to do more creative, more intricate, more professional... well...inspired to do all together better artwork. I come back from meetings hyped and inspired and my latest creations clearly have been influenced by the group. Anyway, once a year we jury a few new members into the group. Now is your chance to come visit a Designing Weavers meeting and see if you have what it takes to be a Designing Weaver. · And want to be challenged to take their work to a higher level. Designing Weavers, a nationally recognized group of fiber artists, is a vital organization with a long history of encouraging excellence in the fiber community. All members are juried into the group and actively participate in the organization while striving to improve their individual level of creative achievement. Designing Weavers began in the early 1970s with a small group of women coming together to share their knowledge of weaving. The group continues to be a strong force in the art and design community and contains a number of nationally known fiber teachers, artists and designers. Check out our current members at www.DesigningWeavers.com. One benefit of membership is the camaraderie with other respected fiber artists, many of whom attribute advances in their work to inspiration gained from the group dialogues. The members’ interactions often provide insights into methods of meeting artistic challenges and discovering new ways of working. The yearly project offers opportunities to grow and develop as an artist. Hearing how other members approach a new work, make plans, develop the piece, overcome difficulties met along the way, and create a display mechanism is very inspirational and fuels their collective creativity. Honing personal presentation skills among friendly colleagues and getting constructive feedback is an added benefit. Designing Weavers continues to be dynamic by encouraging individual development and providing opportunities to showcase the group’s collective work. The stability and strength of Designing Weavers comes from the accomplishments and commitments of the diverse membership. Do you wonder whether you have what it takes to be a Designing Weaver? Come to a meeting and find out! 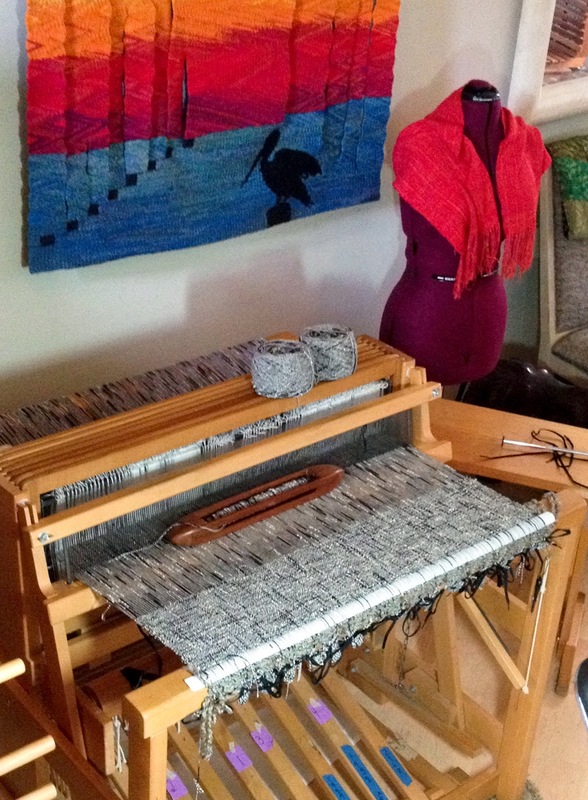 Fiber artists interested in joining Designing Weavers must visit either the April 23rd or the May 28th meeting and provide a short introduction to their work. The meetings are in the evening from 6:30 – 9pm with an optional dinner at 5. After attending one meeting any fiber artist who wishes to be considered for membership beginning the following year (commencing in September of each year) should submit a short resume of his/her fiber art experience along with samples or photographs (not slides) to the Membership Chair no later than June 30. Regular meeting attendance is required throughout the year in order to maintain membership. Meetings are held in Los Angeles, CA, nine times a year. If you are interested in joining please contact Carollee Howes, the current President of Designing Weavers at howes@gseis.ucla.edu. I belong to a great artist group; California Fiber Artists and I just finished putting together our new Marketing Portfolio for 2014. The portfolio is hot off the presses! Take the preview and check out the wonderful work the group does. It never ceases to amaze me - the diversity and beauty we can achieve with fiber. California Fiber Artists present WILD an exclusive exhibit designed by CFA for the Saaski Gallery. In Carlsbad California (a great spot to break off the 5 freeway between LA and San Diego!) California Fiber Artists present Best of the Best commemorating 10 years of extraordinary art! I began with the thought this would be a fairly simple project; just eight feet of yardage woven in plain weave. Straight and lovely edges would be a must. The final size would be critical since I would be creating a frame for another piece of art. The yarn is a high twist yarn...a very high twist yarn...in fact this is the yarn with the biggest twist I have every seen in my life. Without any tension it simply curls around itself or around anything nearby. That makes doing anything with it a battle. Even turning the skein into a ball of yarn was a chore. Measuring out the warp was a nightmare with all the ends continuously twisting around itself. Warping was another formidable battle but once on the loom under tension all seemed well. All the things I knew about weaving didn't seem to work well with this yarn. But I adapted and am happy with the initial results. This is the first time I will be weaving across the entire weaving width of my Gilmore loom. It's 32 inches wide. The only way I have found to make it work is to stand up and weave. My arms are just long enough to throw my biggest boat shuttle across the warp and catch it on the other side. A couple more inches in arm length would be quite useful. I have always cuffed up my sleeves of my shirts and jackets and never thought twice about it until I went to golf school where I learned I had shorter than average arms for a woman. I was being custom fit for a set of golf clubs by a couple of golf pros (men of course) who were having the toughest time getting my golf swing to work with any of the women's clubs. They kept telling me to stop bending over so much...I kept saying I couldn't hit the ball unless I bent over... Finally one of them suggested longer clubs. The other argued it was my stance... When they finally swapped me over to those longer men's clubs it was a miracle... my posture improved and the golf balls went twice as a far. Great clubs....but I gave up golf entirely once I retired from the corporate world. Now I weave. I wove the first bobbin worth of weft today on the new warp. I have to check every shed before beating to make sure there is no twisting of the yarn so its a bit of a slow go. I was able to get 7 inches of material from one bobbin...it's the longest bobbin I have - 10 inches. So at that rate if I weave one bobbin a day, it will be done in two weeks. Not bad! So now I have three things to do every day... weave on my Gilmore, weave on my big Shannock and work on refinishing my counterbalance loom. Lot's of stuff happening this month! 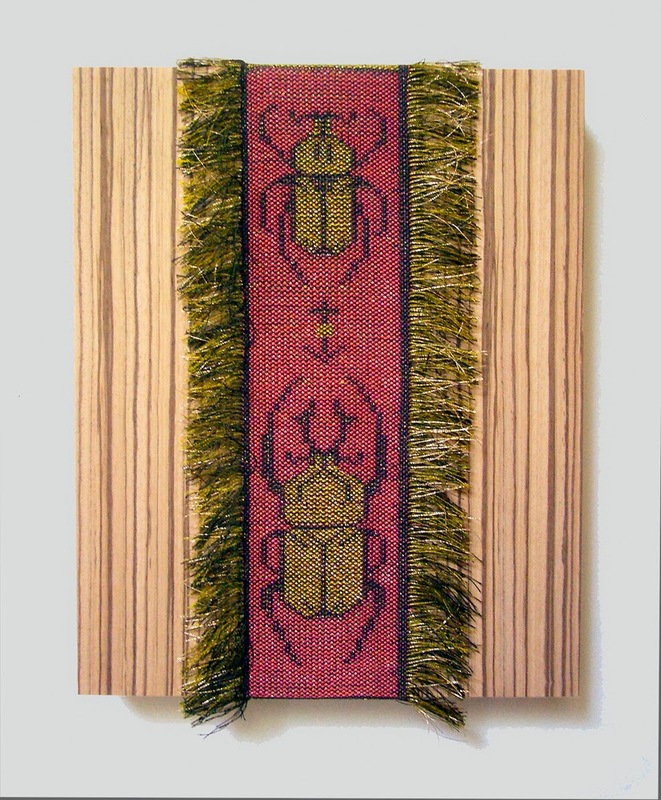 I am excited to have two species of my woven beetles in the WILD exhibit at the Saaski Gallery in Monroe Washington. I do love beetles and love capturing them in fiber. Below is a photo of one the two species at the exhibit - a dragon beetle from Thailand. 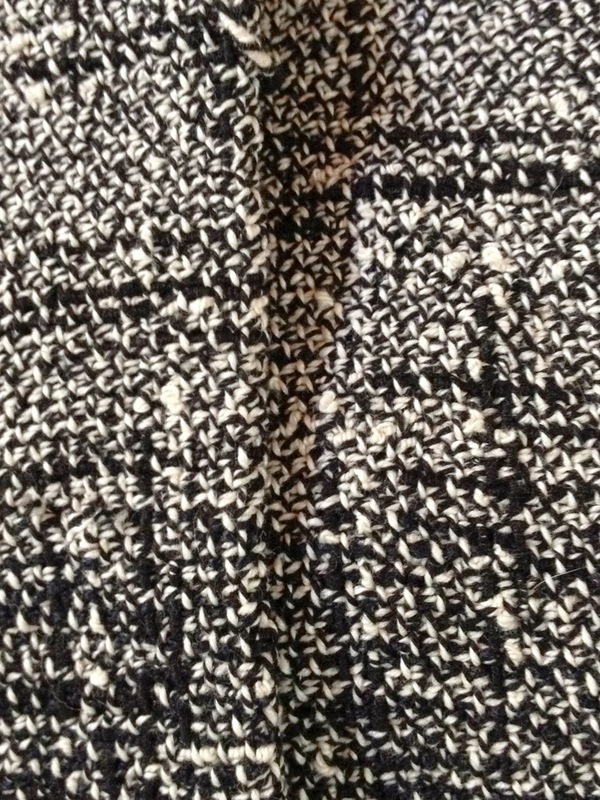 This is my interpretation of the Dicranocephalus wallichi wallichii woven with rayon and metallic sewing thread. It is mounted on zebra hardwood. WILD is an exhibit by California Fiber Artists so it is packed with fabulous pieces by a couple dozen artists. If you are in the Seattle area March 13th - May 31st do check it out!